Water science fair projects can be fun! Let's have some fun with water! 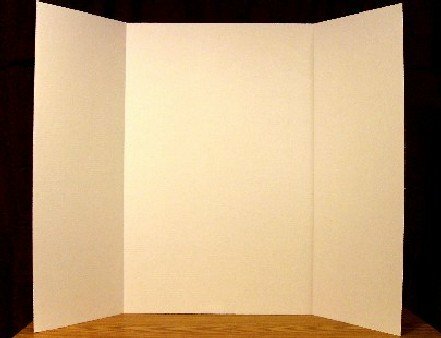 ...let's ask some questions for water science fair projects. See if you can add to this list for these water science fair experiments. What does an ocean smell like? A lake? A river? Your bathtub? Have you ever tasted water from any of these? Do you think they all have the same kind of water? What happens to the ocean in the winter? Do you think it freezes? This is a good question because we can try it out in our freezer at home. But don't try it yet. We need to answer our important question first! Write it down on a piece of paper. Don't change it until you see what the water does first. ...let's see what happens to the water we have! 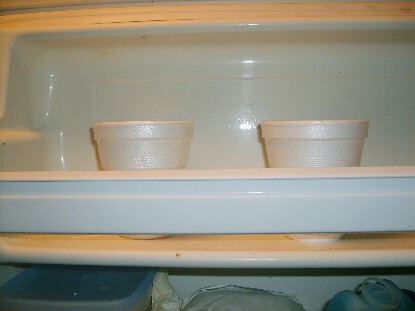 Make sure you have two containers exactly the same size. 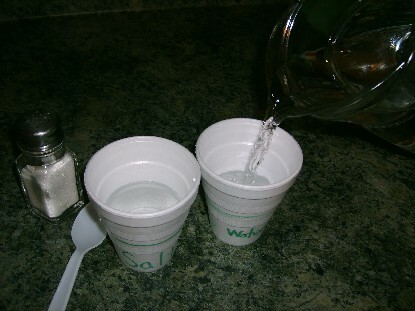 Fill both cups with the same amount of water. It's important that the water level is the exact same level in both cups. Add a spoonful of salt to one cup and stir it a lot. Leave the other with just water in it. Don't do anything to the second cup. 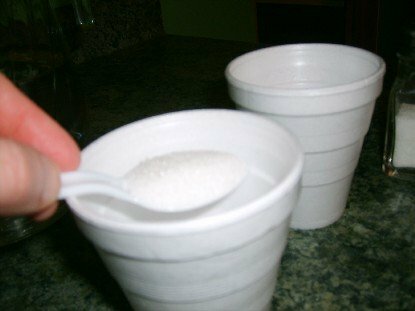 Now, label the cup with the salt in it "salt" or draw a your picture of an ocean on a label and put it on the cup. Label the other cup "fresh" or draw a picture of a lake or river on it. Make sure you know which cup is which. Now, leave them overnight. Don't check on them until the next day. The next day, what do you see? Is there a difference between the two cups of water? Now it's time to tell what you saw. Draw a picture of both cups. Try to show what you saw in each cup. Also, write a report about what you saw. If you want more information about putting together displays click here. You can also buy displays at many retail stores that fit water science fair projects. However you do it, make sure you follow science fair rules! If you want to get some ideas for your display we have some examples for you. Just click here for ideas about water science fair projects displays and other tips and hints. Try playing with some of the display ideas you see. You should be able to find something that will fit water science fair projects. You don't have to use the exact ones we use. Adapt them. Make them fun! Be creative! Click here to see the Kindergarten page again! Had enough of water science fair projects. Click here for the homepage.